A good friend is expecting a baby in early July, so I crocheted her a patriotic gift in recognition of the nearest holiday in the United States, Independence Day. I replaced the traditional white with "wheat" colored yarn for a vintage stars and stripes feel. The adorable wooden buttons were the final touch. I used this hook size for all pieces. The suggested size for the booties was 3.75mm, but I crochet tightly and the 4.5mm hook gave me the correct length for the base of the sole (gauge based on first two rows). The suggested hook for the beanie was 4.0mm for DK weight (#3) yarn, but 4.5mm gave me the correct gauge based on the first three rows using worsted weight yarn. My favorite parts of this beanie and booties set are the wooden star buttons. 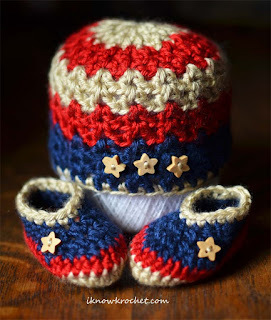 They are the perfect size, shape, and color for babies (of course, babies should not be left alone with them due to the choking hazard, but they are certainly cute for photo props). They are a natural wood color and unfinished, meaning they will probably not hold up well with repeated washings, but newborns grow so quickly that I doubt they will be washed too many times. I bought the stars in the photos on Etsy. However, the shop that sold me the stars no longer has them in stock. If you would rather not buy 200 stars from Amazon (even though it's the best deal), then Etsy is a great alternative. Try typing "wooden star buttons" and look for a shop near your home to save on shipping. The holes in the buttons are pretty tiny. Here is the link to the method I used to thread the yarn through the holes. Briefly, I used crochet thread (regular sewing thread would also work) to make a loop through a single button hole, placed the yarn into the loop, and pulled it through. I used 20 gauge crochet thread, since I had an entire skein leftover from my plumeria flower project. I'm happy to have found a use for this thread, not only for pulling yarn through button holes, but also for newborn hat photos (it made a cameo appearance in the first photo above). I used the method at this link to change colors, but crocheted over loose ends as I went along and cut the yarn each time I changed to a new color. Unfortunately, cutting the yarn left several sets of loose ends that tended to stick out from the V-stitches (more noticeably than they would stick out from standard double crochet rows). In hindsight, I should have just left the wheat and red yarn ends intact, not crocheted over them at all (this is what was done in the color changing video tutorial), and carried them down the inside for the row repeats ("stranding"). This would eliminate several of the loose ends in the wheat and red section. 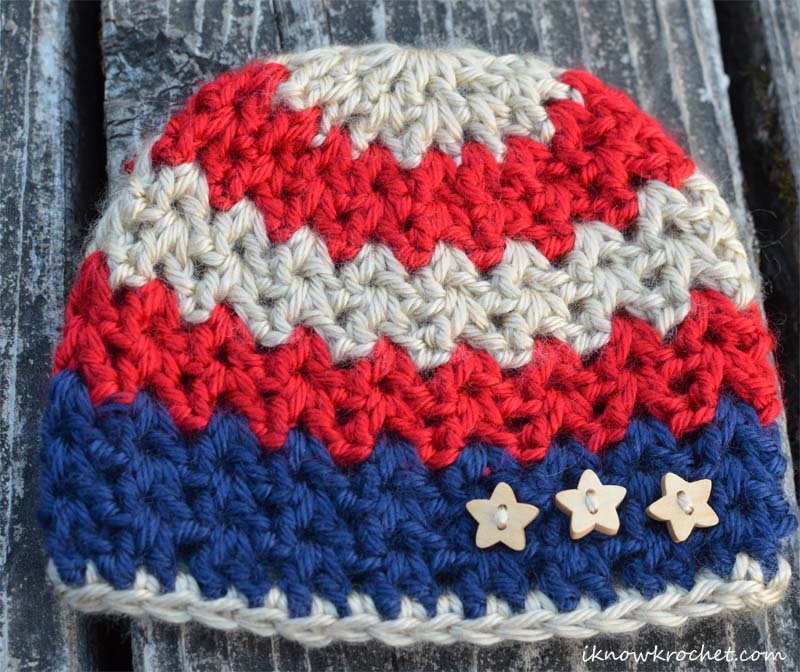 Since this beanie is not reversible, it wouldn't be an issue to have some yarn strands exposed on the inside. There is a part of the pattern that I was confused about at first. At the end of each row, the instructions call for a slip stitch into the third chain of the beginning ch 4. This essentially turns the fourth chain into the first "ch1 space," which is also the spot where the slip stitch should go at the beginning of the next row. Although the total stitch count per row is not provided, the instructions are pretty fool-proof as long as you start in this spot (located immediately next to the final slip stitch of the previous row). I only added one button per bootie, as opposed to the three that were suggested in the original pattern. 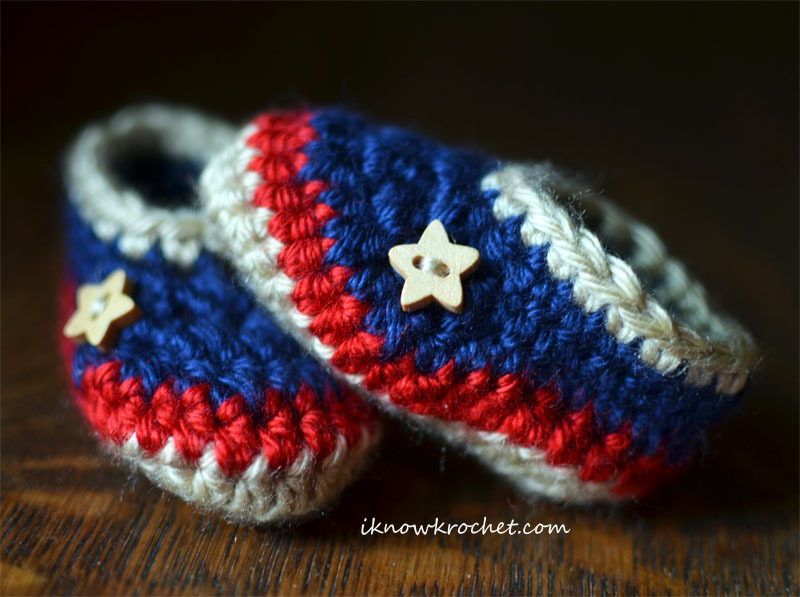 If I had made a larger size, then three buttons might look good, but only one star button fits well on the newborn size bootie. These booties ended up a bit on the small side (a common theme for me). I think they will fit a newborn, but may require a bit of stretching. 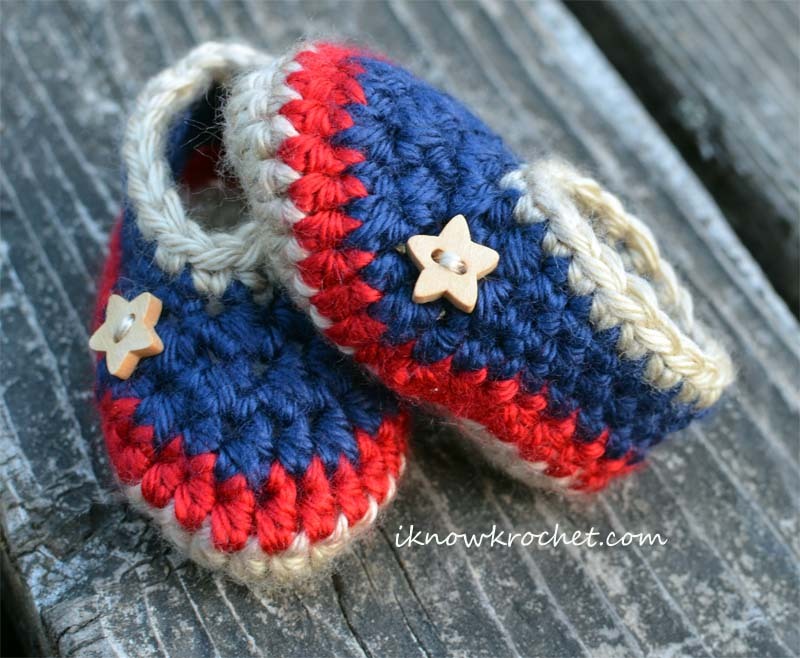 I hope they at least fit for a Fourth of July newborn photo shoot! I love this color combination and I'm already planning more projects. What other project do you think would look good in red, wheat, and blue? 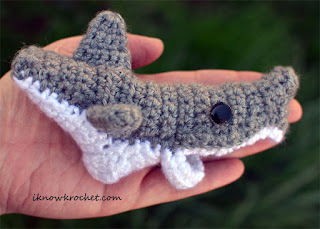 Shark Week on The Discovery Channel will be here soon, so I thought it would be fun to get into the spirit with these crochet shark booties! 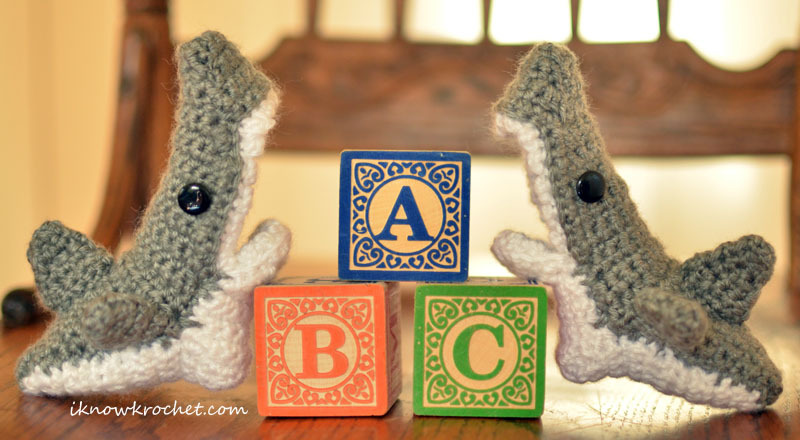 I made these in newborn size as a baby shower gift for a good friend who loves sharks. 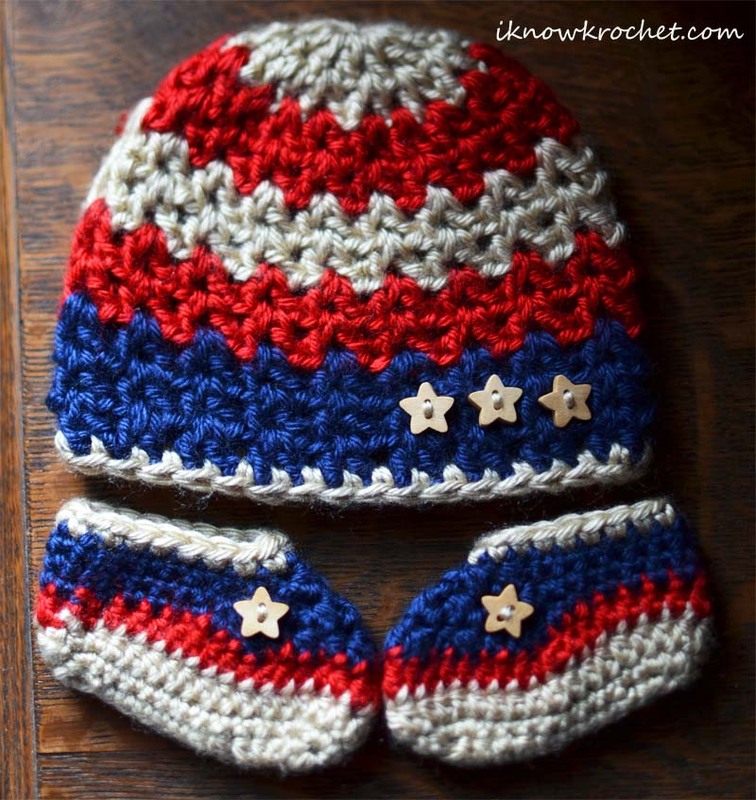 This crochet pattern is very creative and unique. The mouth and nose are so perfectly proportioned that these really look like baby great whites! 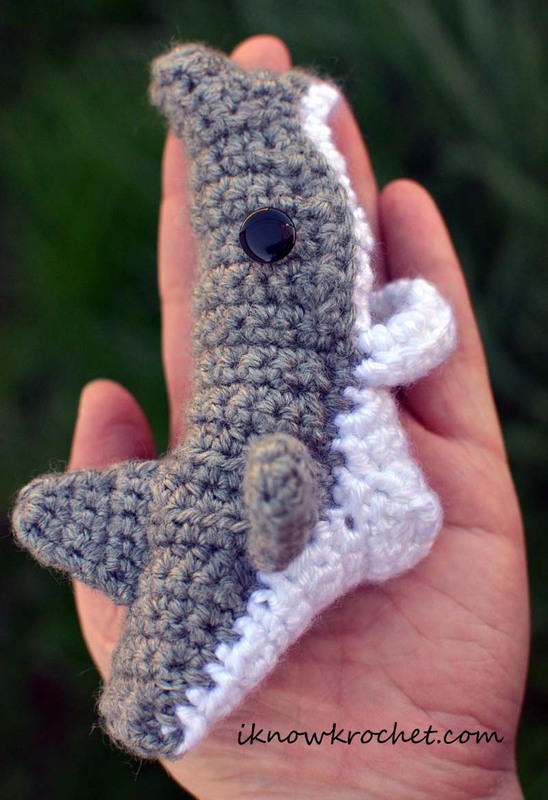 I love the fact that the sharks' mouths are designed to nibble a baby's toes (although they actually nibble the baby's leg). All sizes from infant to adult are included! This pattern is very easy to follow. It is not crocheted in the round so it requires some assembly, but I found the assembly instructions to be straightforward. 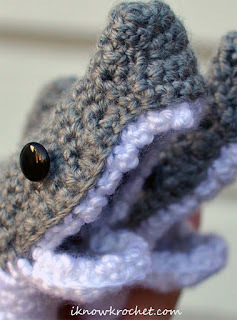 I made one tiny modification, which was crocheting only in the back loops of the stitches around the mouth while adding the teeth. This resulted in a subtle "gum line" that separates the teeth from the grey skin (shown in closeup photo on the right). 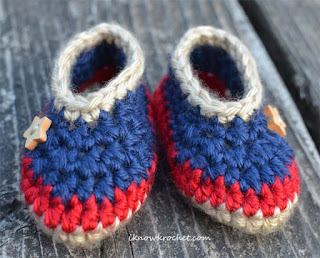 I used single crochet for the seams, but the next time I make these, I plan to sew the seam using a whip stitch because I think it will look cleaner and eliminate a bulky seam on the inside that might be uncomfortable, especially if these are made for someone who is walking (not an issue with the 0-3 months size that I made). I sewed the buttons on as securely as possible, but they were still not as snug as I'd like. I think this is due partly to the fact that the shank did not fit into the hole between the stitches, as I intended. Embroidered or safety eyes might be a nice alternative to the buttons. 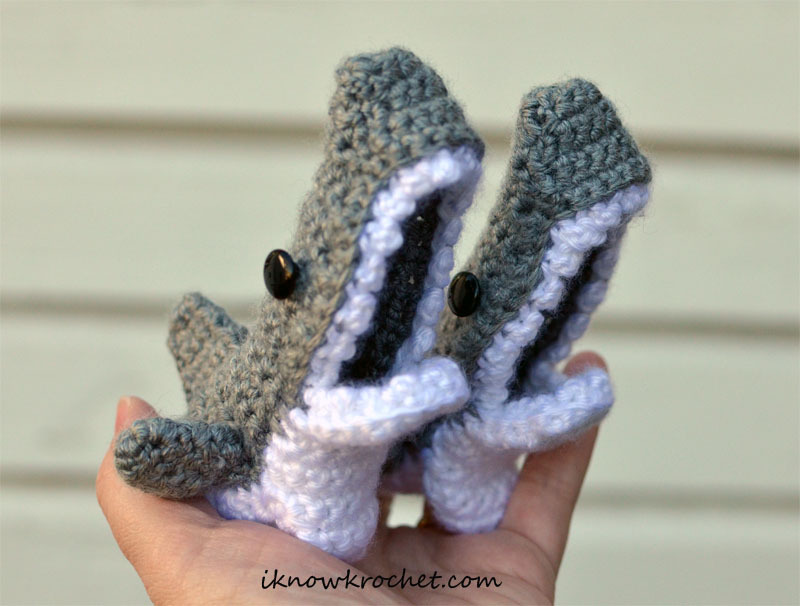 I contemplated adding a tail to make these anatomically correct, but decided that the absence of a tail is just enough to keep these sharks looking more like booties than wearable amigurumi. 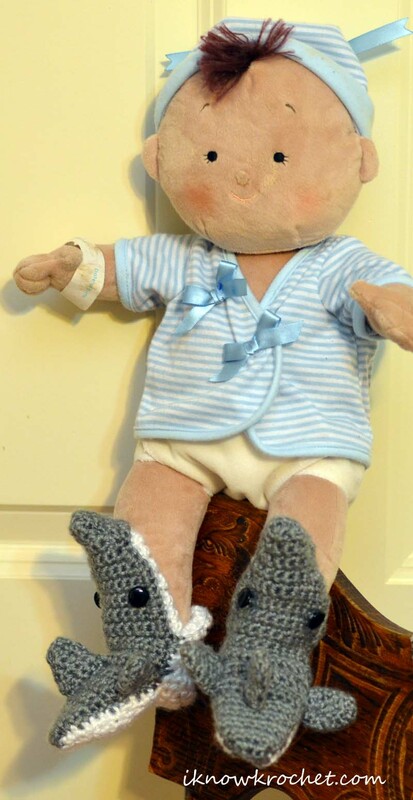 nibbling your baby's toes during Shark Week?